AMD is coming out swinging this year. Their latest line of Radeon cards, the Fiji line, have put up a serious competitor to NVidia that hasnt been seen in the last 4 or 5 years. Now they have entered the double card package market, previously occupied by the lone NVida Titan card. If the specs released today are true, this is in fact not a competitor, but rather a Titan killer. AMD has started this card off with two Fiji chips, which means we’re still looking at two GPUs with 4GB of HBM RAM each. Which does feel a little odd since AMD already has an 8GB card in the R9 390 and its pretty much the lowest cost 8gb card that exists at just over 300$. To set it apart from the 390, the Pro Duo has a closed loop water cooling solution built right in. It required three separate power connectors, as you can see in this image below, and its a hefty beast of a thing. Some back of envelope math, and a little googling tells me that if this GPU actaully needs all three of those PEG connectors, its pulling close to 450 watts of power. Say good night to your wallet, and hello to hi power bills. Since this is two GPU’s processing at the same time, you will still have all of the problems of crossfire, and you wont get any of the benefits of having to 930’s which together would sport 8gb of ram, and far more processing power than this card. The card is also more expensive than just getting two 930’s running about $650USD, but if you dont have the footprint for two GPU’s I can understand why this might be attractive. AMD is pitching the Radeon Pro Duo as the “most powerful platform for VR,” and they’re touting the benefits of their LiquidVR SDK again. AMD also notes that this is the initial product in their AMD VR Creator line. 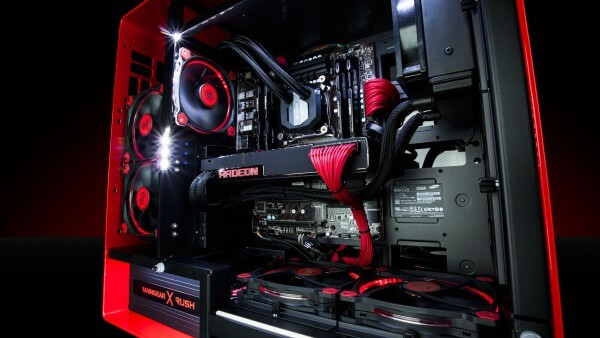 AMD anticipates the Pro Duo will be available in early Q2 2016.